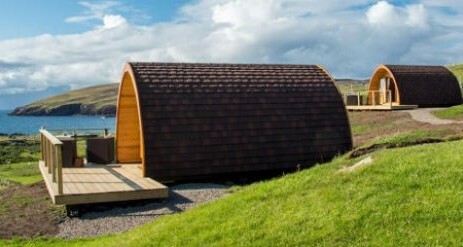 Little Abodes two glamping Mega Pods with hot tubs are nestled on our croft in the beautiful North West Highlands of Scotland. 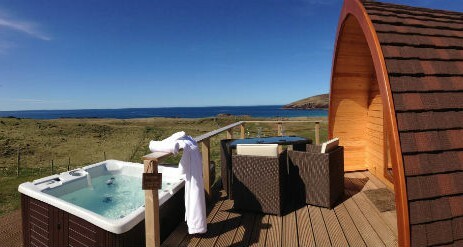 Each pod has their own private hot tubs and front deck overlooking the breathtaking panoramic sea views. Were in a great location for outdoor activities such as Hill Walking, Cycling, Fishing or just the opportunity to relax and soak up the glorious settings. After all, fast modern lives sometimes need a big antidote. 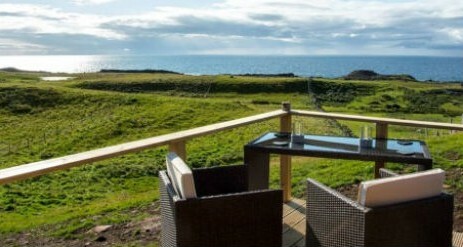 The Little Abodes are a luxurious fully equipped way to glamp set in wonderful croft land! Most people like the thought of camping but feel so reliant on the weather. Seasons are extended and wash out weekends are eliminated! Living in the landscape… all without sacrificing even an ounce of comfort. Glamping at The Little Abodes is a way to connect with nature without having to rough it. 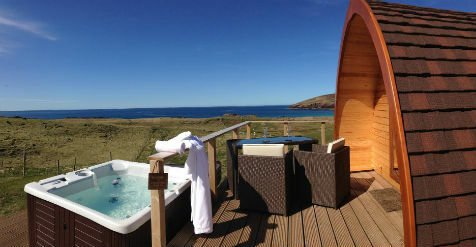 Both our pods now feature their own private hot tubs**. Escape to The Little Abodes and take a break from the hustle and bustle. 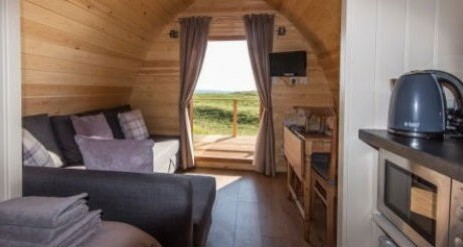 Glamping with us provides you with an opportunity to relax and recharge when life becomes hectic and lets you experience nature in an unforgettable way. Its a moment by yourself or with loved ones to make memories. Fresh air, beautiful beaches, absolute leisure and soaking in a warm bubbling hot tub after that long walk….what more could you ask for? 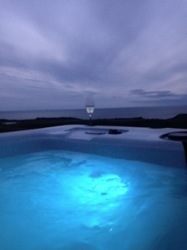 Immerse yourself in our warm bubbling hot tub to melt the stresses away and come out feeling renewed Spend an idyllic evening stargazing, admiring the stunning sea views and sunsets which can be appreciated from your own private hot tub and front deck. Our spa’s have 14 powerful hydrotherapy jets supported by a 2.0 horsepower water pump, ensuring a vigorous massage to ease those tensions away. The Cyprus spa also features an 18 point, LED mood lights inside the spa. This lighting system will ‘mood’ between colours, illuminating the spa water and reflecting off the spa shell. 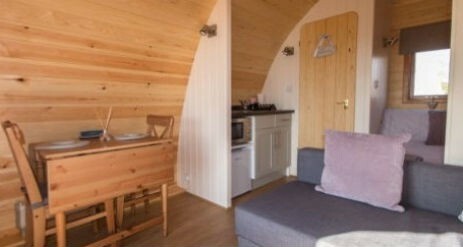 There is a small Kitchen area which includes a Sink, Mini Fridge, Microwave, Kettle and Toaster. You will be provided with Cutlery,Crockery and Microwavable Accessories. Although you will be able to make the basics in the Pod please note that you’ll be unable to cook a Sunday roast! You’re welcome to bring along your camping stove, but naked flames are forbidden inside the Pods! There are lots of foodie places in Lochinver. 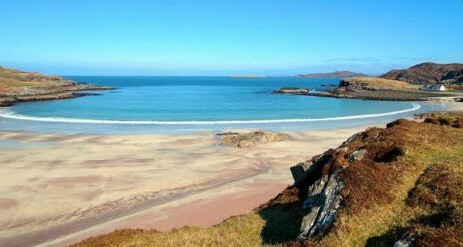 Often referred to as one of the last truly wild places in Europe. The area is popular with hill walkers and mountain climbers. The famous outlines of the mountains of Canisp and Suilven dominate the landscape of Assynt. Details of walks and climbs can be found at the Visitor Centre. Fishing is another attraction – trout lochs, salmon rivers, fly fishing and sea fishing are all available locally. The village has a wide range of facilities for local and tourist alike. There are two Grocery Stores, a Butchers and a Newsagent as well as a Bank, Petrol Station, Post Office, Cycle hire, Leisure centre, Doctor’s and Dental Surgery. For the visitor, there are craft & gift shops and once a month local craft markets ‘Made in Assynt’are held in the Village Hall. There are some fantastic restaurants here in Lochinver. There is one Michelin starred restaurant in Lochinver, the Albannach, The Chez Roux restaurant at the Inver Lodge Hotel plus newly opened ‘Peets Restaurant’. 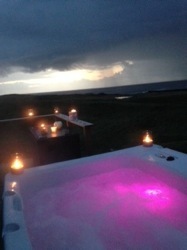 Enjoy soaking away in a warm bubbling hot tub giving you the ulitmate stargazing experience at The Little Abodes. The skies in the Highlands are perfect for stargazing, as the degree of light pollution is minimal, and there are few obstructions to viewing the sky. Lochinver has been granted the highest class of award, being a place where the Milky Way can easily be seen with the naked eye. Aurous borealis’s or Northern Lights have just recently graced us with there spectacular light show…have to say one of the most amazing things i have ever seen. Because of their unpredictability, if you see the Northern Lights, then just enjoy them as an unexpected bonus to your Highland holiday. Maximum of 2 Adults & 2 Children sharing per pod.